Food is a wonderful way to travel. From delectable lemongrass chicken bánh mí out of a food truck to homey braised short rib ravioli from a TV chef’s restaurant, just a quick sampling of Los Angeles’ diverse food scene makes apparent the range of food experiences to be had. 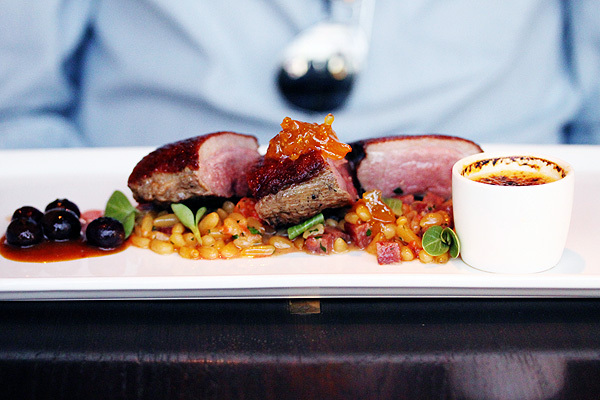 Earlier in the summer, Stephen and I drove to a posh hotel called the London on a balmy evening to try Gordon Ramsay’s tasting menu in the name of 1,000 dining points on OpenTable. 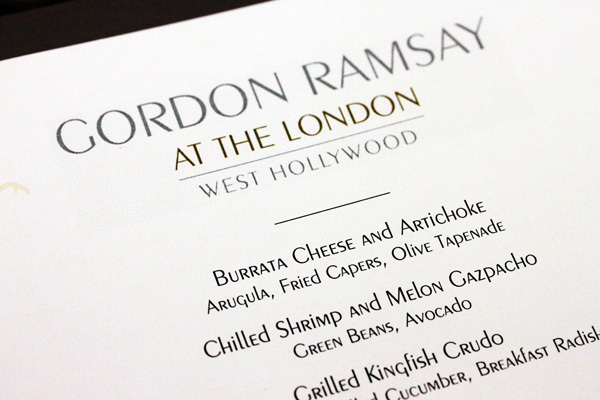 My last meal from Gordon Ramsay’s repertoire was when I was in London. Though food at the London was perhaps not quite as flawless as the food I had in London, we both an enjoyable time and would definitely return to enjoy some of the more extraordinary plates we tried. As I write this, there is a tab open in my browser for my ongoing search for truffle oil. Though Anthony Bourdain has wailed about the gratuitous abuse of truffle oil, I have found myself dreaming of ways to recreate this simply addicting, super luxe version of cheese and crackers. According to our waiter, it is crostini with mascarpone cheese, garlic, and truffle oil. OpenTable says that the restuarant serves French/Contemporary French food. Though perhaps many of the ingredients and cooking techniques are classically French, I am inclined to suggest that the tasting menu at the London exhibits international influences, with clear borrowings from Spain and Italy. 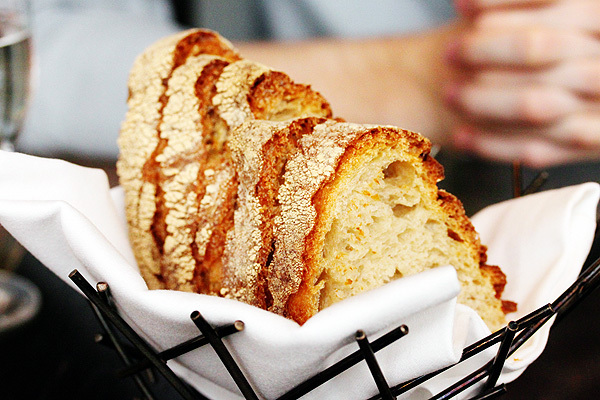 While we waited for our appetizer, we nibbled on some wonderfully crusty and loose bread and butter. Because we were eating an early dinner, the dining room was still relatively empty. It definitely filled up quickly halfway through our meal. 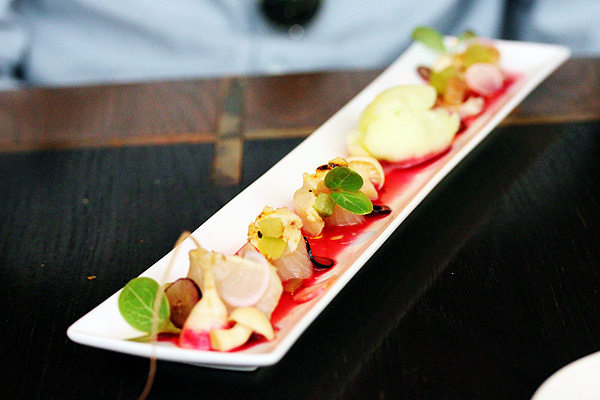 Stephen had a grilled kingfish crudo with pomegrante, chilled cucumber, and breakfast radish. The dish was beautiful, fresh, and tasty. I had the chilled shrimp and melon gazpacho with green beans and avocado. Often I find myself overwhelmed by the sweetness and juiciness of heirloom tomatoes, but I enjoyed this dish because there was enough acidity from the dressing, saltiness from the shrimp, and creaminess from the avocado that it all worked well. 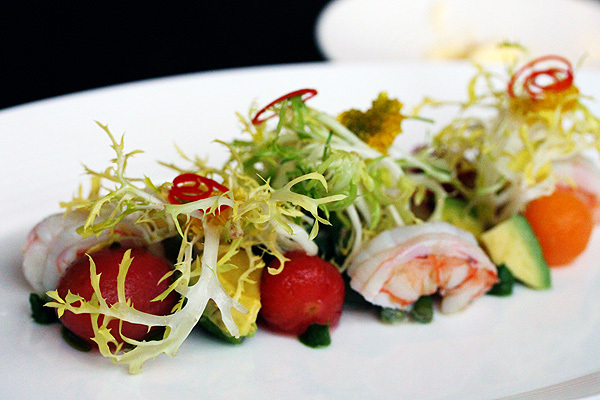 I also really liked how they curled all the elements in these delicate tendrils on the plate. Next, Stephen had a crabcake with lemon (the precise description escapes me) and it was phenomenal. Hands down, one of the tastiest crab cakes I’ve ever had. It was flaky, not overly oily, well-seasoned, and not fishy tasting at all. It was also well-composed enough to not fall apart completely when eating, but retained the wonderful texture of individual fibers of the crab meat. 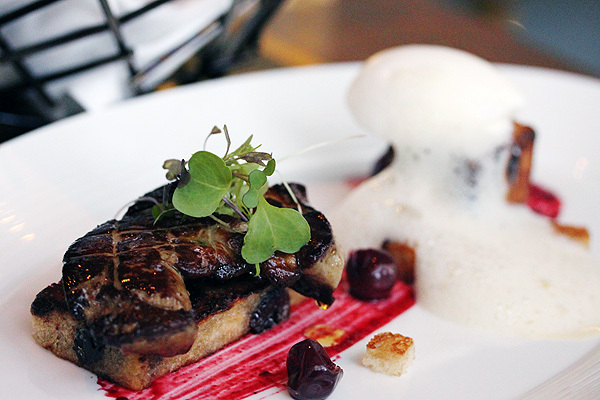 I got the foie gras and toasted chcolate cherry brioche with smoked vanilla bean ice cream. This dish was probably the most unexpected in terms of its flavor profile, and I’m not completely convinced that I liked it. The foie gras had a nice sear, but it was quite salty and needed something to pair it that wasn’t sweet and rich like the strong cherry and the chocolate flavors. I thought the vanilla bean ice cream, though it looked dramatic on the plate, was probably not necessary as it didn’t add much to the plate. Maybe something refreshing like lime with cucumber would have been nice. 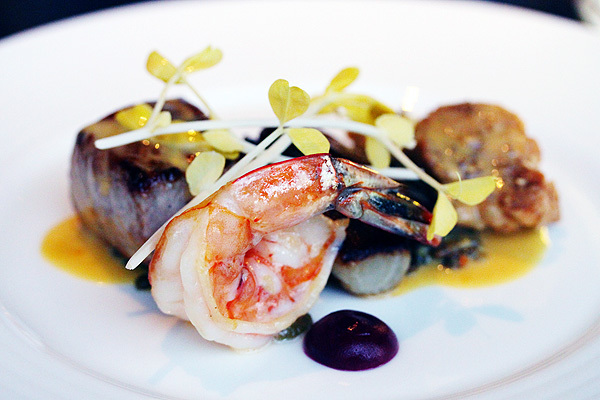 For the main course, I went with veal loin and shrimp, crispy sweetbreads, and Thai curry sauce. The presentation was, as you can see, warm, welcoming, and elegant. The food was very tasty as I can recall, but not hugely memorable. Though moist and tender, the meat didn’t really gain anything from being paired with the curry sauce… perhaps the curry flavor could have been a bit stronger? Next, we had a cheese plate. 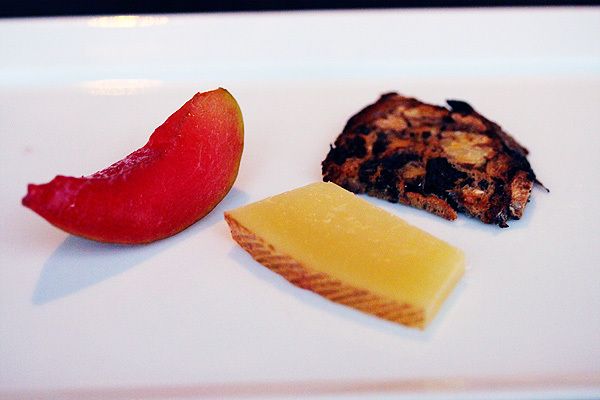 Stephen and I were both relieved that the cheese was something quite mild and enjoyable: a manchego cheese from Spain. I thought it went really well with the oaty raisin crostini, but Stephen was lukewarm about it. Though we were both very full at this point, we just couldn’t abandon dessert. 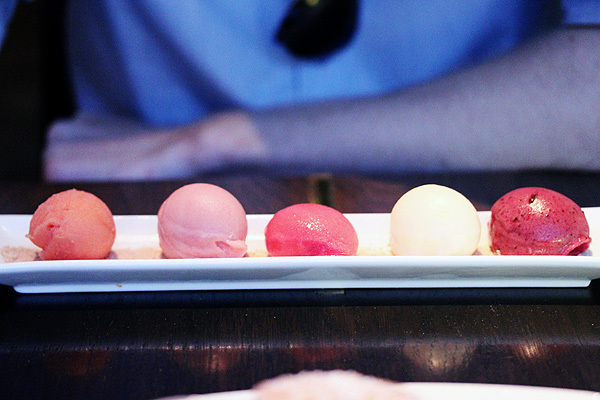 Stephen went with a selection of different sorbets. I believe the flavors were: Pomengrante, white peach, raspberry, citrus, and blueberry. The clear favorites were white peach and raspberry. The blueberry and pomegrante were decent. The citrus one was much, much too citrusy. It was bordering on Lysol-tasting. Eek! I went with a mango souffle with caramel ice cream. 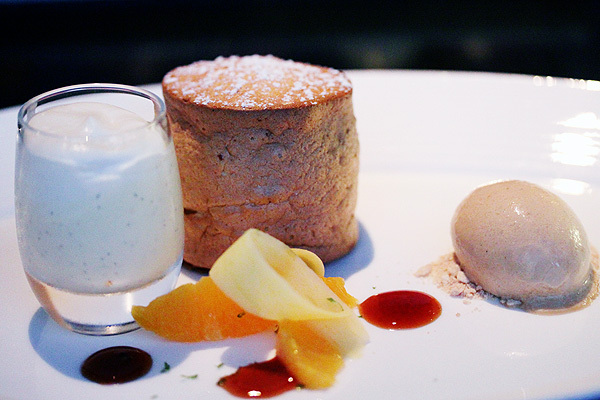 The mango souffle could have had more mango flavor for me, but the ice cream was divine. Paired with the jar of whipped cream (I think), I was definitely enjoying myself. After two hours, we left the London with full stomachs and good spirits. 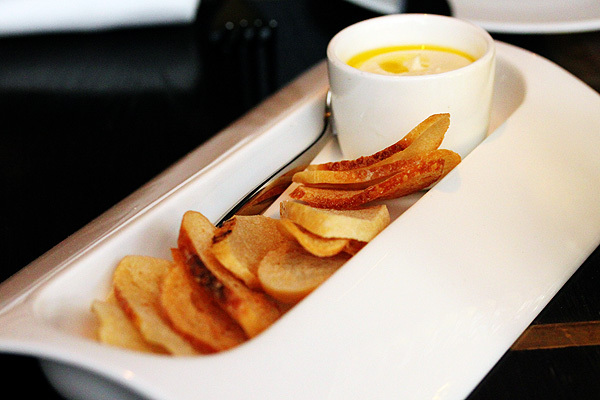 With great service, unexpected and mostly good food, the London is a good introduction to Gordon Ramsay’s fare. I like the pics you take… how was the food in GR place. Just stumbled across your blog & I’m a huge fan of the layout and aesthetic! I was an Angeleno for five-ish years so a lot of these restaurants are familiar and some of my favorites 🙂 The rooftop at the London is absolutely stunning and one of the best places to enjoy LA on a warm summer evening… but I only wish I had half the experience you did with the food! The ONE time I ate there, we got a $30+ pitcher of alcohol that had NO alcohol flavor whatsoever. The food was extremely bland and overpriced. I was so disappointed considering I had such high hopes for Gordon Ramsey! HOWEVER I’m a complete sucker for crabcakes and your picture is suuuper enticing HAHA. I’d go back just to try that again. Hi Emily! Thank you for your super sweet comment about my site design! As for the London, I haven’t been to the rooftop before, though I have seen pictures. It looks like such a romantic place to spend with someone special. The Gordon Ramsay restaurant I ate at is located on the first floor, kind of tucked away. 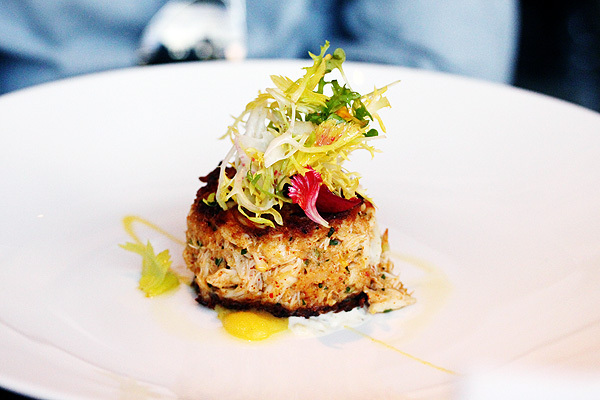 The crabcake (as well as many of the other plates) was wonderful and more than compensated for a lack of beautiful view! I would love to keep in touch with you and I hope you decide to go forward with food blogging. It is such a rewarding experience and definitely a fun hobby for me. Let me know if there are any other restaurants I should try in the LA area too!